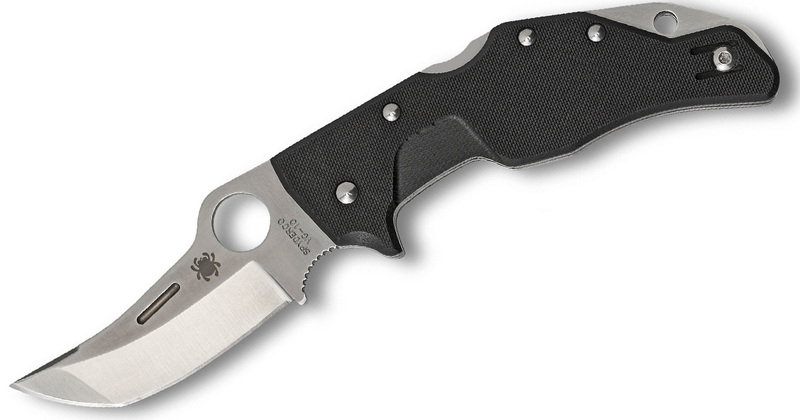 Regular readers here at the Knife Depot blog know just how much we love Spyderco Knives. We’ve written a number of blog posts about the iconic brand, as well as a comprehensive article about its history, designers, innovations, and more. Despite our gushing over Spyderco Knives, we’re not afraid to say the company comes up with some of the most bizarre and strange-looking designs ever. Although many people would call some designs downright ugly, their functionality-over-looks mentality is part of why we love them so much. I went through some of the most unique blade shapes already, which featured more than a few Spydies, but I wanted to dedicate a whole post to interesting Spyderco knives. I originally wrote this post a few years ago with 10, but I’ve since gone through the archives of products and seen some of the latest models and thought it would be a good idea to give this list an update. So now, instead of the 10 most awesomely bizarre Spyderco knives, here are the 30 most awesomely bizarre Spyderco knives. The original list featured the Civilian, but I’ve come to realize the Matriarch 2 with the Wave feature is even more strange. 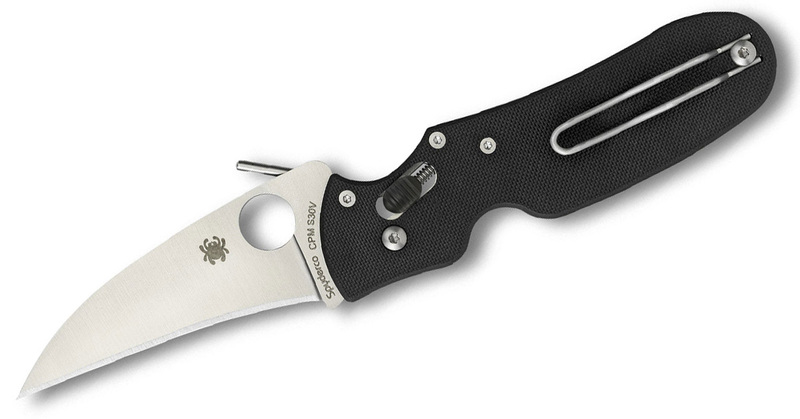 Long-time Spyderco fans have probably become inured to the odd look of the knife since the larger version has been around since the 1990s, but if you give this knife to the common person, they’d likely be confused. 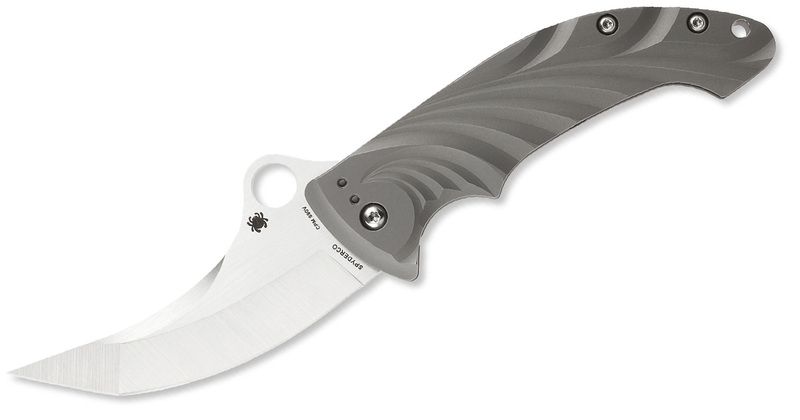 It has a fully serrated patented reverse S-blade with the wave featured made by Ernest Emerson. Users can engage the knife in a single motion out of the pocket. The blade shape and wave give this an almost reptilian look. From the fierce Matriarch 2 with Wave to the pudgy Captain. This discontinued knife had a 4-inch blade with a shape like no other. The lower part of the blade was curved with a bulbous tip. The handle was also somewhat blocky and peppered with screws and rivets. Part of the reason it was probably discontinued was the fact that it was unclear what the goal of the knife was. Next up is the Roadie — one of the most recent models on this list. This design came about after the TSA announced it was going to allow certain knives on planes. 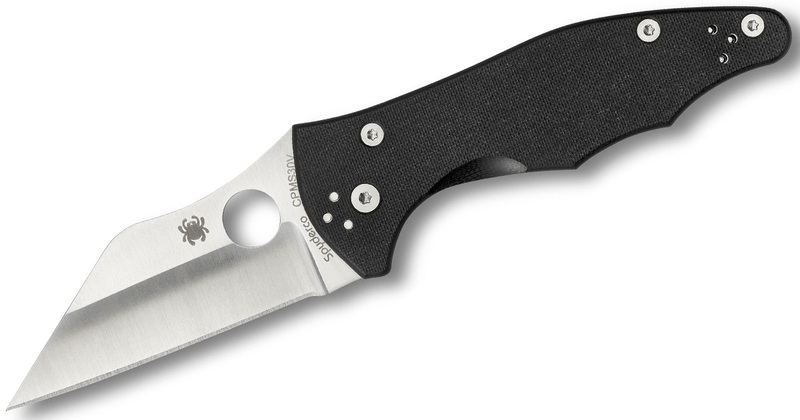 Working within those limitations, Spyderco made the Roadie. 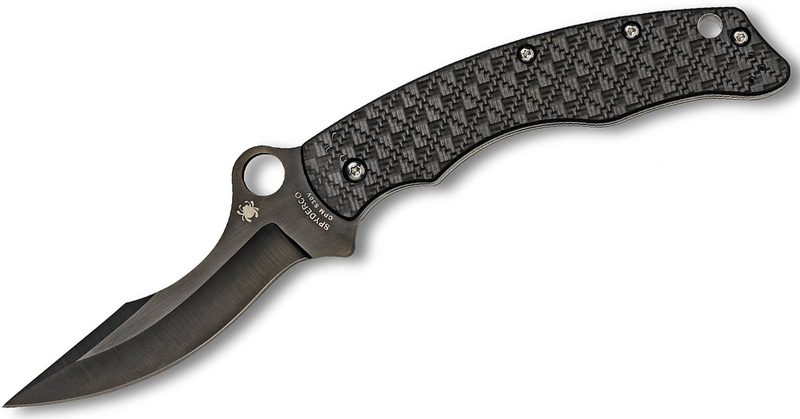 But when the TSA reversed its decision to allow knives on planes, Spyderco went forward with the release. Despite its very odd look, the knife is beloved by diehards. It has a 2.09-inch blade that looks like the head of a dodo and a slender handle. The blade opens up with a pair of symmetrical dimples and doesn’t look intimidating at all. Simply named the Q, this knife featured a fascinating design that’s come in a ton of variations — at least 50 according to Spyderco Source. 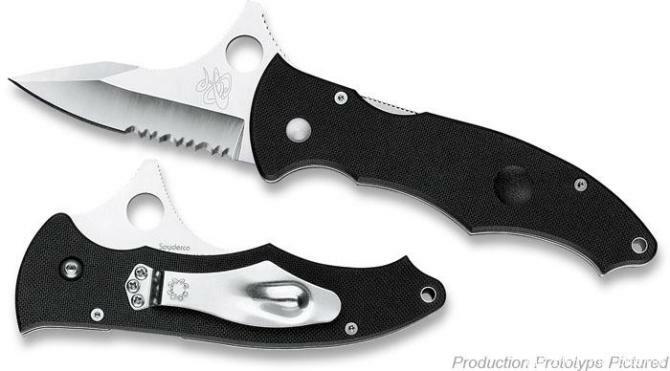 The standard version of the Q has a cutout blade design with the Spyderco logo on a web. The handle also has cutouts and comes in different colors. The real kicker is that you can get the blade design to say various things (such as New York or GBC) or feature landscapes (like palm trees and the sun or a duck). There is also the R, which was a larger version made from better materials. Ed Schempp is known for making ethnic knives for Spyderco, such as the Persian and Tuff. These tend to have shapes and designs we don’t normally encounter, but his discontinued Kris is one of the most bizarre. Kris blades traditionally come in wave patterns and represented a man’s societal standing in the Philippines. The wavy blade is unusual, but that waviness also continues down into the handle. The first of the “credit card” knives. 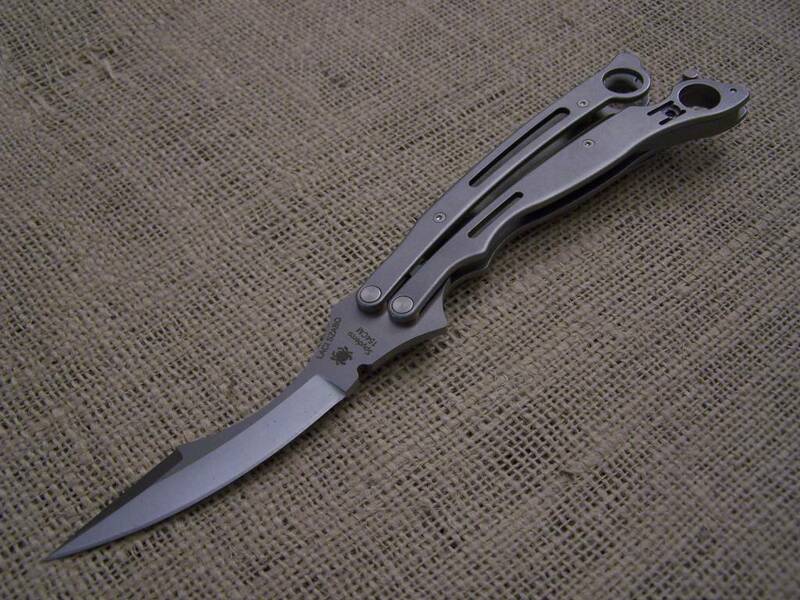 The knife was designed by Eduard Bradichansky, a Russian Israeli toolmaker. A brilliant and skilled man. He was killed by Hamas in the West Bank and his car was burned. He was identified because he had the prototypes for the “SpyderCard” and “Shabaria” models (which he designed) and the metal parts didn’t burn. It was an interesting concept that seemed to get used by a fair amount of people. I’m not entirely sure how thin it was, but it seems better than many other types of credit card knives out there. It is bizarre looking though. Yet another discontinued knife, the Szabofly was designed by fighting knifemaker Laci Szabo and features a pretty odd look. 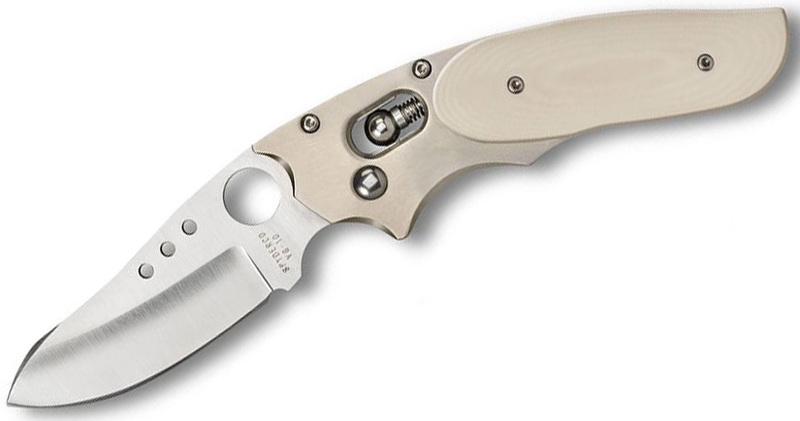 This is a bali knife with a sickle-shaped blade that incorporates the look and feel of Spyderco (which is especially seen in the two Spydie holes you can use to open up the knife). The Szabo folder also gets honorable mention but doesn’t get its own section since it’s very similar to the balisong. The original Yojimbo makes the list for its unusual design by the great self-defense trainer Michael Janich. 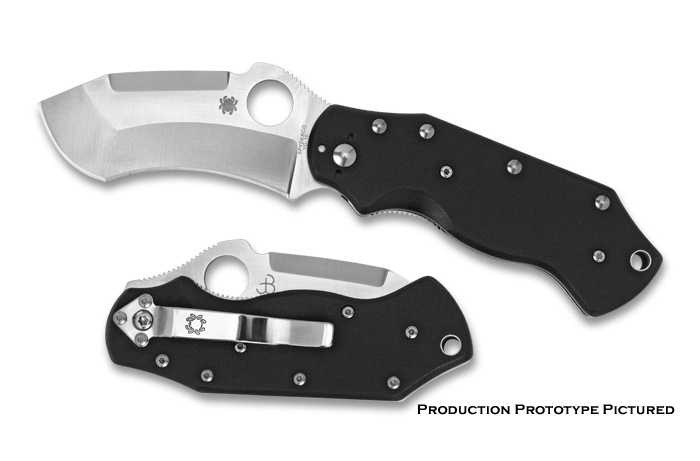 The first version was custom made by Mike Snody before Janich went to Spyderco and pioneered the use of the wharncliffe blade in tactical folders. This was the folding version of the fixed blade knife called the Ronin, which featured similar design elements. 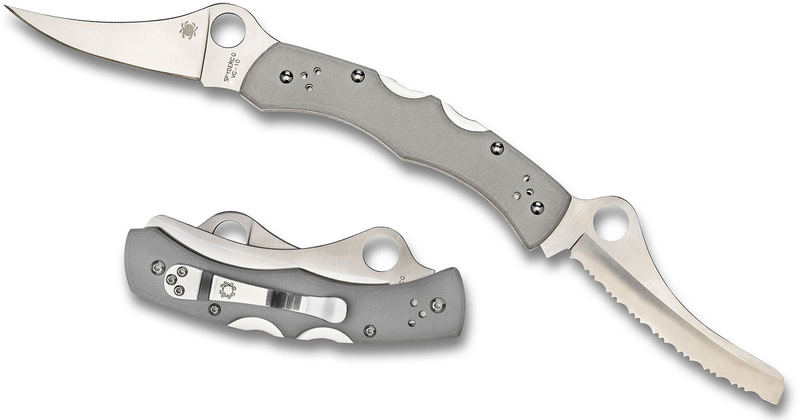 Spyderco said the handle fit the palm like a handshake and the triangular blade was versatile. The Yojimbo 2, which is still available, softened things out a bit and is just as fierce, but the original just holds a special place in the bizarre Spyderco pantheon. Needless to say, I wouldn’t want to cross anyone carrying this knife. This knife was recently discontinued for 2018 after only a few years on the market (it’s still available in limited quantities). 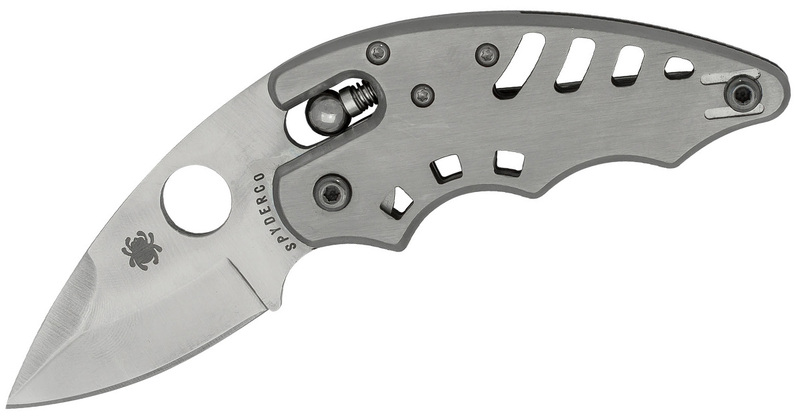 It was billed as the world’s first flipper-opening back lock folding knife. It borrowed design elements from the Swick and Bi-Fold (which you’ll learn about later). I think my knife is ugly, but I know why I love her and it ain’t her looks. The knife has a grip like a pistol and doesn’t look so bad when it’s open but looks crazy when closed and that integral index-finger hole is sticking out the back. Sorry to see you go, Introvert. This is yet another design by Israeli knife designer Eduard Bradichansky, who died in a terrorist attack on the West Bank. The knife itself takes cues from traditional nomadic knives called Shabarias and modern fighting knives. The blade is not particularly unusual, but the handle definitely is. The back of the handle is essentially carved out, so it almost looks like the knife will slice the hand when it’s closed. The handle felt odd to unfamiliar hands, but some people came to enjoy the shape. The Shabaria was discontinued but came back for a few Sprint Runs. 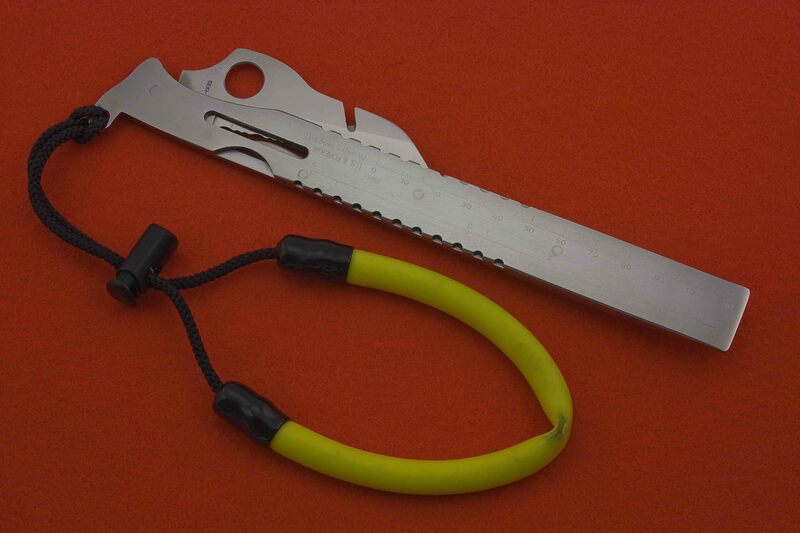 In the early days of Spyderco, the company put out the Dive Probe. Only a limited number of these were made and they’re highly sought after. Apparently, Spyderco mastermind Sal Glesser still used one on his dives. The handle of the knife is long, which allows it to be used for prying. 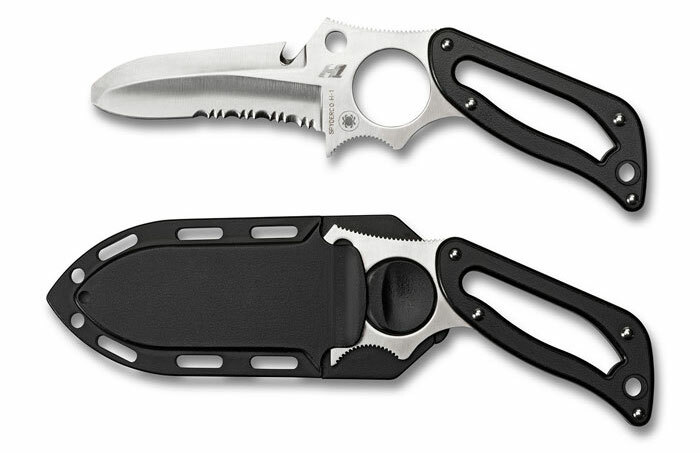 The blade has the iconic round hole, a lanyard to attach it to your wrist, and wire cutters near the back. Certain versions of the Dive Probe were made of ceramic. While this is definitely not the weirdest design, it’s highly unique. 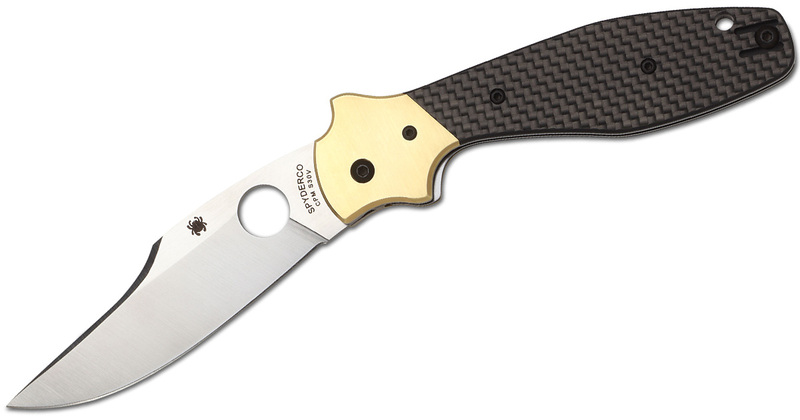 Ed Schempp gave another installment to the Ethnic Series in the Schempp Bowie and it became an immediate addition to the bizarre Spyderco list. It is based off the American Bowie knife with a clip point blade but the overall look is just curious. The blade is 3.72 inches and uses S30V steel while the handle has carbon fiber/G-10 laminate scales, a solid steel backspacer, and dovetailed old-school bolsters with an integral double guard. For some reason, the wire clip makes it look even crazier. 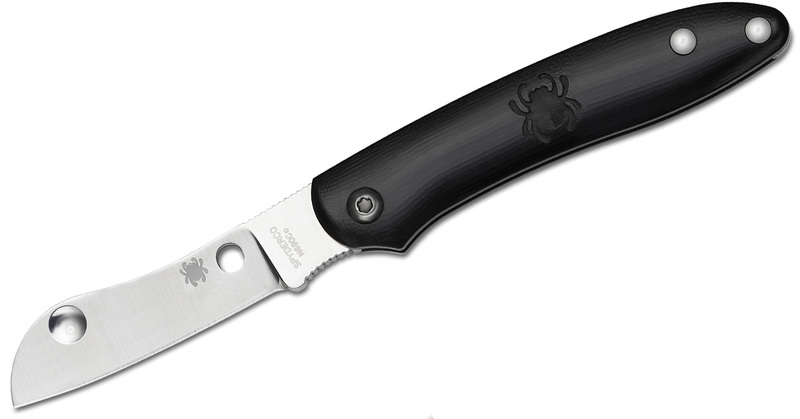 We’ve mostly highlighted the larger knives, but small Spyderco knives can also be strange. Take the Lava, for example. 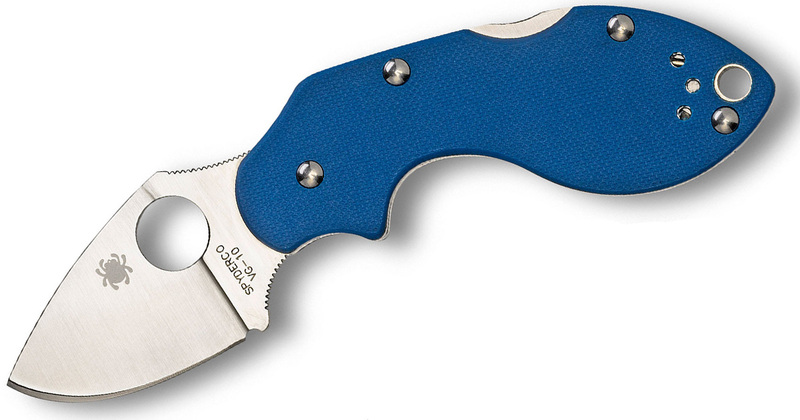 This little guy features a 1.86-inch blade and an overall size of 5.25 inches when opened. It’s called the Lava because it was developed by Chad Los Banos in Hawaii, but I think it could have been called the Hunchback or the T-Rex (see the little T-Rex arms in there). Still, the ergonomics on this little guy were truly excellent. The original was all stainless steel but the blue Sprint Run brings out the shape better. I’m cheating with this one a little because the Bi-Fold never officially came into production. It was planned for 2006, but legal issues surrounding the knife and its classification as an automatic knife threw a wrench in things. This Eric Glesser design folded in half and engaged almost automatically with a little trigger. This may be one of the strangest knife designs ever. We’ll see if this ever sees the light of day. If there was ever a knife that looked like a bird, it has to be the Gunting (which even sounds like a bird’s name). The Gunting has a pronounced protrusion that’s there by design. It’s for pressure point control and striking. It was designed by Bram Frank for Martial Blade Concepts. This knife may not look like much but in the right hands, it can be a truly fierce self-defense tool like no other. 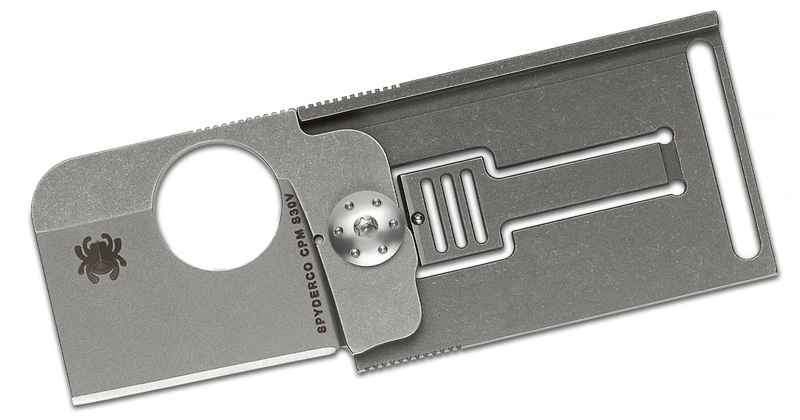 First produced in 1999, the SpydeRench is a truly odd multitool. 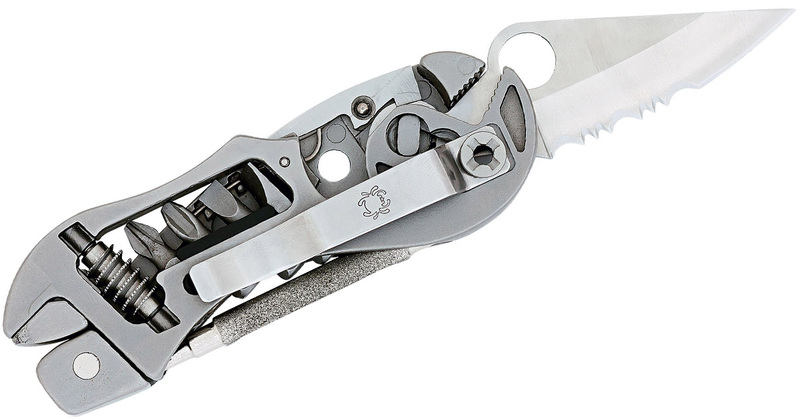 It’s a complex tool designed to go head-to-head with the Leatherman. It was made in conjunction with an aerospace engineer and featured a crescent wrench, slip joint pliers, four screwdriver bits, a full-size locking blade, and more. 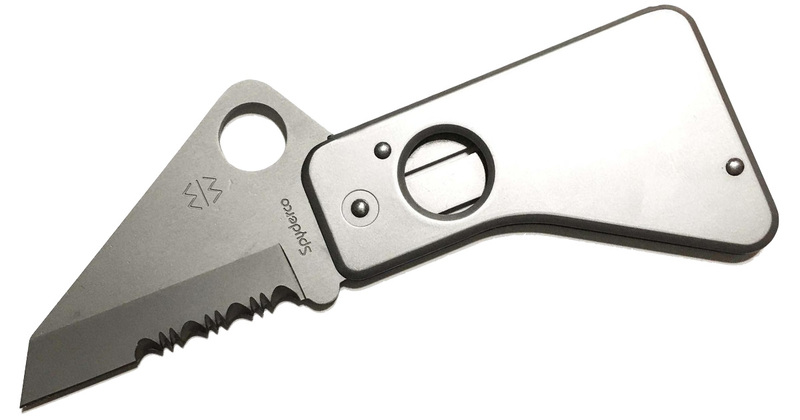 The knife can even come out to give you a fully functional pocket knife. Dive knives gave Spyderco an opportunity to experiment with designs and try out some things they normally wouldn’t on other knives. That’s where the Caspian Salt comes in. The discontinued Caspian Salt was made from one piece of H-1 steel. The knife looks like it was trying to pack in a bit too much. You have a partially serrated edge and a plain edge, a wire cutter, an index finger hole, and a lanyard hole. The knife itself is an awesomely unique design, but it’s no longer available. This may be one of the most unusual Spyderco models out there. It was made by Knifemaker Spyderco Jot Singh Khalsa (hence the name) — a follower of the Sikh religion who specializes in Kirpans. He put his well-known flair and artistry on display in this knife. 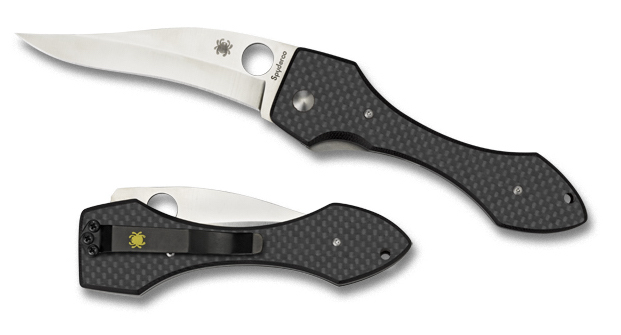 Spyderco says it’s “one of the most unique and rare Spyderco production folders ever produced.” It has a 2.91-inch blade with a protruding piece of steel that houses the Round Hole and a curved handle. After it was forced from the catalog in 2000 due to production problems, it came back for a Spring Run in 2013. 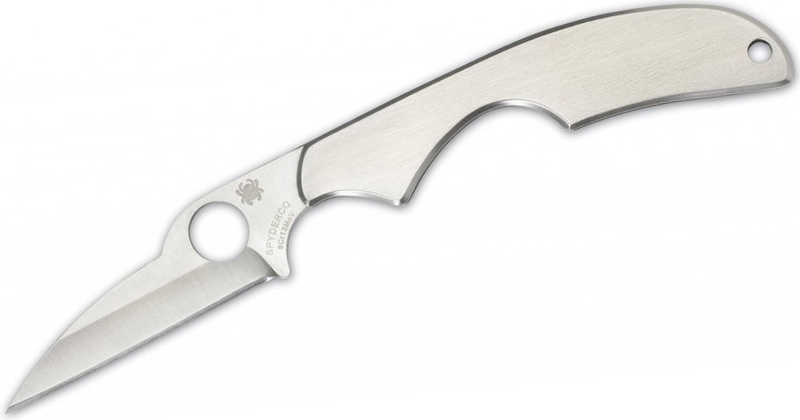 The Kiwi is an unusual Spyderco design in that it doesn’t really look like a Spyderco, except for the recognizable Round Hole. It is thin and lightweight with an ergonomically designed handle that allows the user to choke up on the blade. Although the Kiwi 4 is still in production, the early Kiwis with the little hump in the blade is the really odd one. They say it was designed in the dark with all of the focus on ergonomics and functionality. The blade is stocky at only 2 inches with a downward tip for fine cutting. Unfortunately, the knife went the way of the Dodo. 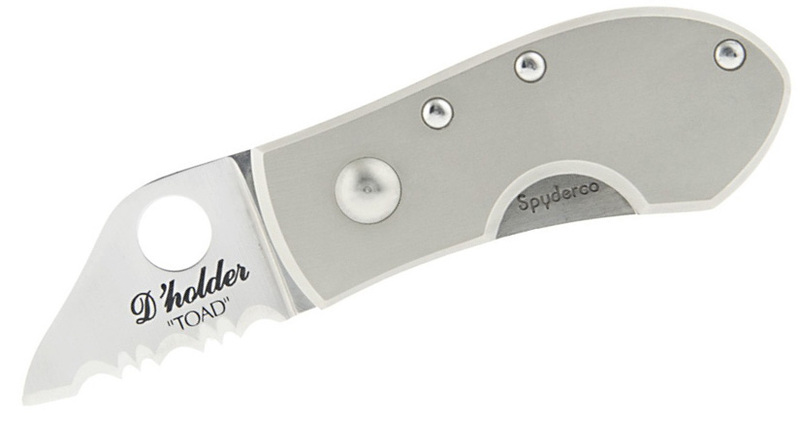 Knives with multiple blades date back years (think patterns like the Jack knife or pen knife), but Spyderco put a different twist on it with two full-sized blades on either end. Brian Tighe did something like this later, but the Dyad first came out in 2000. Both blades can be opened with one hand and the blade are 3.37 and 3.77 inches. One has a serrated edge and the other a plain. Ed Schempp could be on this list more than he already is, but I thought I’d try to limit his appearances. Still, I think the Balance is a strange design. Its name is no metaphor. When closed, the knife is symmetrically identical on both ends. It’s a fat little guy when closed (which is why they made the smaller Equilibrium). When opened, the knife almost looks like a khukri — another one of Schempp’s designs that could have been on this list. The nature of the design means you’ll be choking up on the blade quite a bit, giving a big handle to blade ratio. At one point, the Phoenix was among Spyderco’s most expensive knives because of its titanium handles, ball-bearing lock, ivory Micarta overlays, and VG-10 steel blade. The knife is designed by Howard Viele and looks like his creation except for the hole instead of the oval. There are a lot of dots in the design and the knife looks like a mish-mash of elements. It is a knife that some people deemed to call ugly. 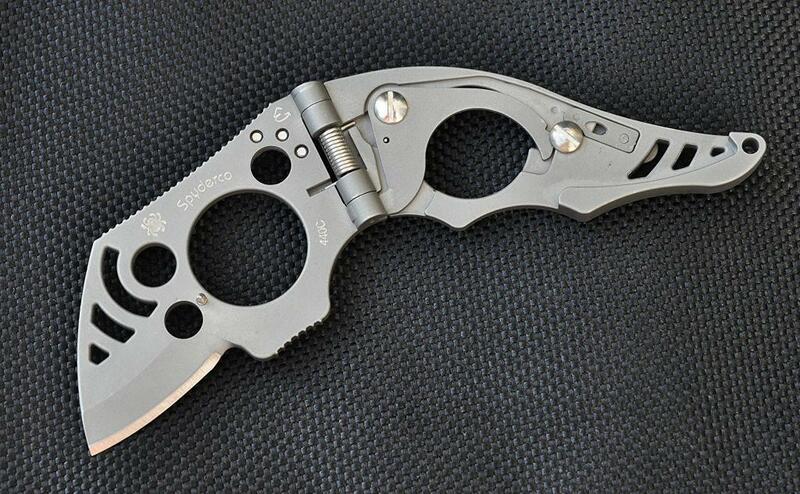 While I wouldn’t go that far, it does look like a strange Spyderco design. The blade of the Battlestation is a unique hybrid profile that features a slightly curved, Americanized tanto-style point and a strong saber-ground PlainEdge™ cutting edge. Ground from VG-10 stainless steel, it also features twin fullers (grooves) in the blade flats and a beveled swedge at the tip to ensure a strong but capable point. An index-finger choil at the heel of the blade allows the user to choke up for extra control and features carefully machined jimping (textured grooves) for extra grip security. 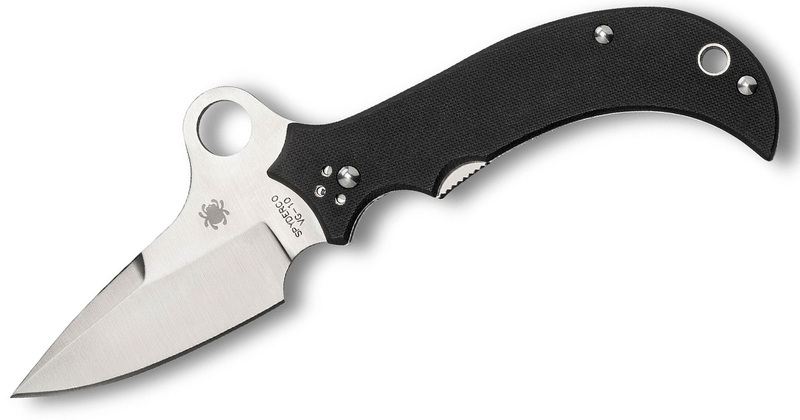 For swift, one-handed opening, the blade includes a 13mm Trademark Round Hole that also unmistakably identifies the Battlestation as a Spyderco design. And that’s just the blade. Some people love this knife and some people hate it because of the strange design choices. I didn’t put the dog tag folders on here because they are a popular design by Serge Panchenko, but there’s also the lesser known Squarehead folder that looks like the dog tag folders. It is a design from electrical and electronic engineer Darriel Caston. 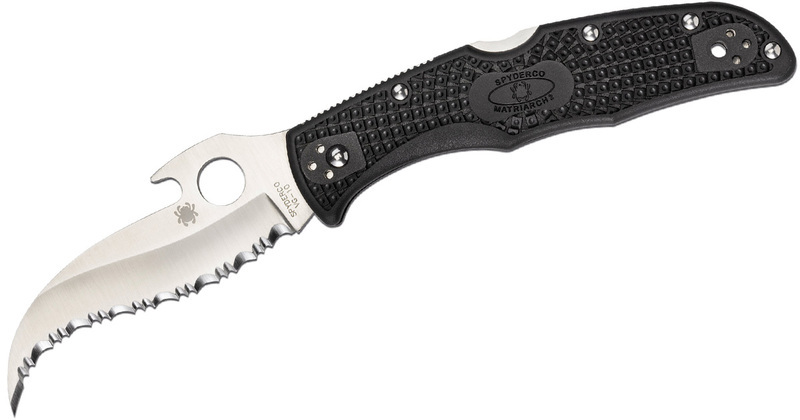 For being such a small knife with a 1.3-inch blade, it is packed with features and premium materials. The blade is S30V and the handle is titanium. It even has an integral liner lock. The blade is chisel-like and has the Round Hole. There’s a new lightweight version with FRN handle scales. The Tighe Stick, made by the great Brian Tighe, is often described as a beautiful knife and it’s not hard to see why. But that doesn’t mean its design isn’t strange. The blade itself is like the Gunting except the ramp does not serve another purpose. The knife is said to have a “dramatic upswept blade” made from S90V steel. At an MSRP of $479.95, the knife was targeted at collectors and features a handle with two solid titanium scales boasting an intricate sculptured 3-D pattern. And much to the chagrin of almost everyone, it’s also a tip-down only carry. It was discontinued for 2018. As a “reverse-edge” tool, the P’Kal’s handle is ergonomically designed to be held with the sharpened edge facing inward toward the user to facilitate powerful pulling cuts. The 2.95-inch blade has an interesting design and a removable Emerson opening mechanism that even Emerson enthusiasts might not be aware of. 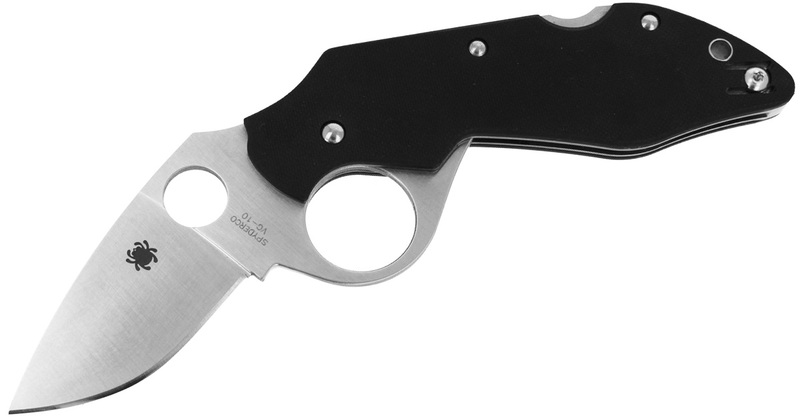 Designed by self-defense expert Craig Douglas, the knife takes inspiration from a system of Filipino martial arts tactics. A trainer is also available for those who are interested in seeing the true power of this knife. 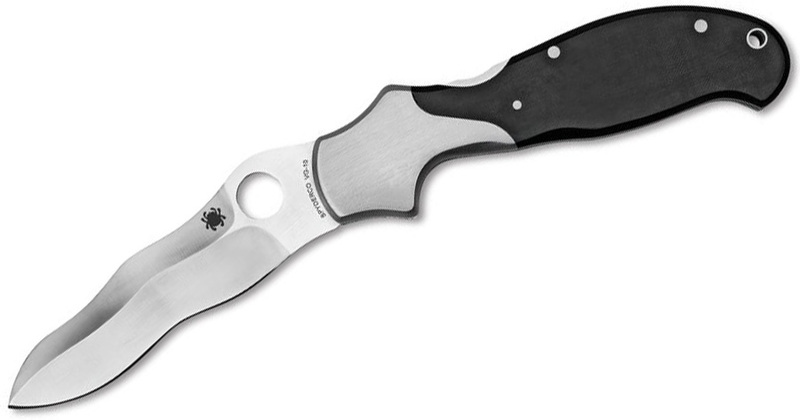 Although there aren’t any many fixed blades on this list, the need for a Round Hole makes fixed blades from Spyderco naturally bizarre. The SPOT overcompensates with the holes by having six! 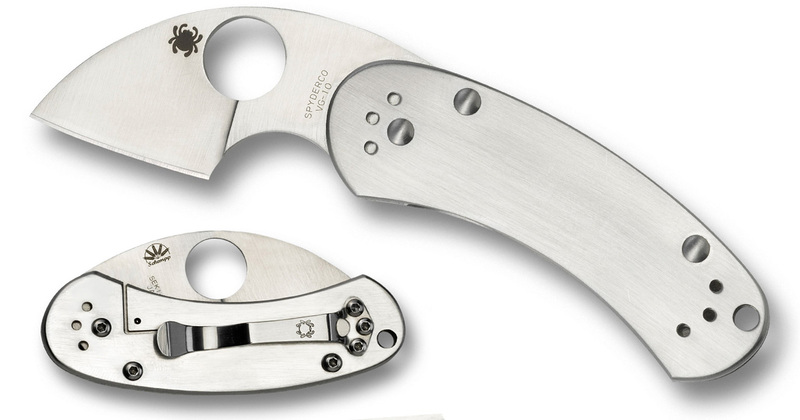 While this includes a hole for the index finger, the knife just has an overall strange look it (which Spyderco calls a “spotty” appearance). 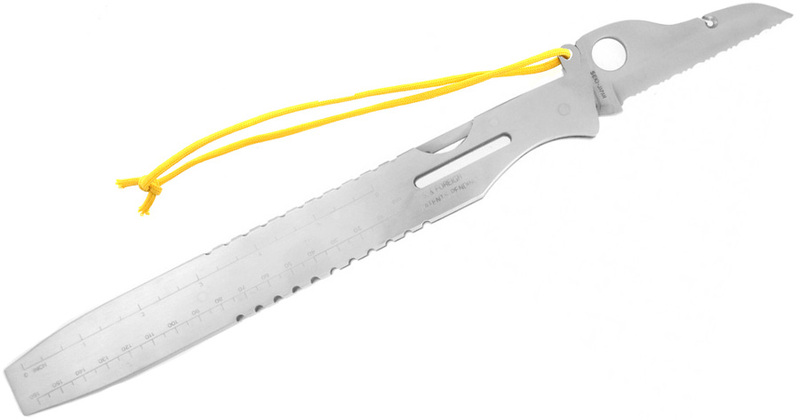 This knife is meant to be a neck knife that’s good for runners, truck-drivers, kayakers, and anyone else who may need a cutting tool handy outside the pockets. This was the first neck knife from Spyderco and it is a curious one. I’ve heard people try to say this is the homeliest of all Spyderco knives. It is indeed a small, frumpy folder that looks toad-like. These were only sold for a few years and are said to be hoarded by collectors. The blade length is under two inches and is made by D’Alton Holder. I love Eric Glesser, but he can make some bizarre knives as you’ve from the list. The last is yet another Eric design and it’s a weird one. The Poliwog is another of Eric Glesser’s designed-in-the-dark creations that puts ergonomics ahead of everything else. Yup, that just about sums up its appearance. When closed, the knife resembles a little spaceship and doesn’t fare much better when opened. Its inner workings are exposed and easy to clean, which is a plus. This design is so far before its time that people still don’t get it, years after its release and discontinue. IMHO, Eric’s designs define the “next generation of knifemaking.” He sees things for what they are and what they could be. The Wog fundamentally reevaluates what a knife lock does and what makes one work in a long-term fashion. Well said, but I’m not sure it will make people look past the bizarre design. Great selection but i liked the first one on the main page of this site. Dont care for all these others. I have a Q. Got it with a subscription to BLADE Magazine. And how ’bout the Meerkat? The hidden unlock mechanism is so cool. I bought mine years ago; the blade is marked AUS-6. I will bet that a collection of all 30 will worth a fortune to future collectors! !